It’s a good start, but Microsoft needs to refine and iterate to succeed. Microsoft's Surface Studio is a bold device. Ostensibly an all-in-one PC, it's also a major play at winning more creatives over to the Windows way of life. The bulk of the Studio is a 28-inch display mounted on a pair of "zero gravity" hinges that allow it to act as a regular monitor or fold down into "Studio mode" for a writing and drawing surface. In addition to 10-point multitouch, the display allows for interaction with a Surface Pen and a new accessory called the Surface Dial -- a small metal puck that can be placed against the screen and rotated. The display runs at an ultrahigh resolution (4,500 x 3,000) and can switch between the wide DCI-P3 color gamut and the more common sRGB with the push of a button -- a useful feature allowing designers to see what their creations will look like on other devices. Inside the base is a pretty powerful PC. The $3,000 model comes with an Intel Core i5 processor, 8GB of RAM, a 2GB GeForce GTX 965M GPU and a 1TB hybrid drive, while the high-end $4,200 model has a Core i7 CPU, 32GB of RAM, a 4GB GeForce GTX 980M graphics card and a 2TB drive. At those prices, with the incredibly high-spec display and the focus on Pen input, the Studio is clearly not meant for the average user. Microsoft says it's "designed for the creative process," pitching it as the center of your workflow. But is this what that market wants, or needs? We spoke with a number of professionals across multiple fields, from video-game design to illustration, to gauge their initial reaction and see what Microsoft needs to nail for the Studio to be a success. Microsoft is in a good position coming into this gambit. The Surface series, especially the most recent Pro 4 tablet and Book laptop, has been received positively. Both work with the Surface Pen stylus, and offer a cheap, all-in-one solution for working away from a desk. Several creatives we spoke to did just that. Scott Coello, a freelancer animator and director, uses Wacom tablets like the Intuos and Cintiq as his main setup, and a Surface Pro 4 "for the road." Comfort Love and Adam Withers, co-creators of Rainbow in the Dark, The Uniques and The Complete Guide to Self-Publishing Comics, use Wacom and Yiynova tablets with displays for the bulk of their work, and a Surface Pro 4 when not at their desks. "It's like our digital sketchbook," said Withers. Love continued: "We use it for presentations, working on scripts and lettering our comics on the road." Despite the good faith in the Surface as a device, the Surface Pen itself has a mixed reputation. Hayden Scott-Baron, a game designer and freelance illustrator, recently started using his Surface Pro 4 connected to an external monitor at his desk instead of an iMac. "The Surface Pen is pretty fantastic, but definitely not as comfortable as the Wacom pens for longer sessions," Scott-Baron explained. Latency -- the Surface Pen has higher input lag than Wacom's high-end solutions -- is "not actually a deal breaker" for Scott-Baron, but "the lack of responsiveness with light pressure is a problem." Other designers agreed. "The pressure sensitivity could be a little better," said Love. "It's hard to get a perfect taper on our lines while we're drawing sometimes." Indeed, sensitivity and handling are big complaints with the Pen. 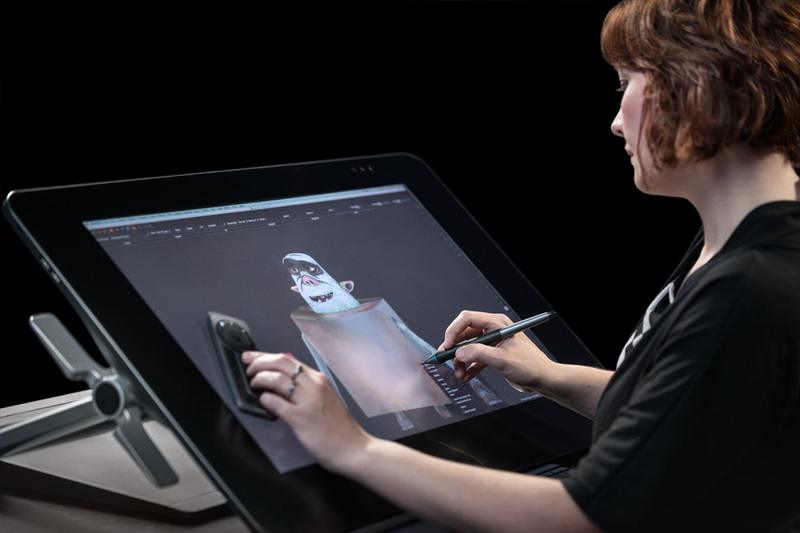 "Anyone coming across from Wacom's Cintiq or Intuos -- and Apple's iPad Pro -- will understand that tilt and rotate is kind of important to the feel of drawing," said Coello. The Surface Pen just doesn't work well at sharp angles. "I've always found when I hold my pen in this position on a Surface, I can't see the cursor as it's registered itself underneath the nib, which makes it awkward if you're working on finer details. I always end up having to hold my pen straight upright, which doesn't feel natural whatsoever." Think about it: You typically hold a pen or pencil at an angle, and that angle can be oblique, especially when shading. Other stylii are more capable of handling different grips and angles. As Coello alluded to, even Apple's Pencil does a better job, although accuracy, latency and application support are huge issues there too. The Pencil is simplistic, but although the Surface Pen offers more features, it also suffers from a lack of support and customization. "The side button and eraser is awkward to press and can't be customized to behave differently in different software," Scott-Brown explained. "I'm lucky that Clip Studio lets me use it as a color picker, but in software Photoshop you're limited to the default behavior. The lack of customization makes me worry that the Surface Pro will never allow such tweaks, unlike Wacom's offerings, which are very flexible." Comparisons with Wacom came up in every conversation -- that's no surprise, given it's the market leader. Creatives are used to a high level of sensitivity, good handling and customization options. Applications like those offered in Adobe's Creative Suite are geared towards being controlled with only a stylus. Wacom also offers accessories like the Express Key Remote, a small controller with 17 buttons and a touch ring that can be configured to perform various tasks, which can replace keyboard shortcuts in many applications. The Wacom Cintiq 27QHD, with Express Key Remote. Microsoft's answer to this is the Dial. Placed on the Studio's screen, it activates a radial menu, allowing you quick access to things like brush and color settings that you can cycle through and select by spinning it. It can also rotate documents, and track back through changes. To the casual observer, it's one of the most interesting accessories in years. But Scott-Baron, who uses a Pro 4 daily, wasn't convinced. "[It's] large and goofy and seems like it needs more controls on there. Anything that could be done with the Dial could probably be done with a UI window instead, especially if I can use multitouch while using the pen." Only Coello said he would definitely buy a Dial. "We're key-command junkies," Withers explained. "Our left hands are hovering over our keyboards constantly, and we've rigged up our primary art programs with a lot of custom commands. Having to take our hand off the board to use this little Dial thing -- for the few things it would actually be useful for -- would actually take longer than just tapping the keys that do more or less the same thing." The Dial also doesn't have the full weight of Adobe's support behind it. Though it will work in apps like Photoshop, interaction is limited to zooming and other basic functions -- there's no radial menu with all of Adobe's tools to play with. 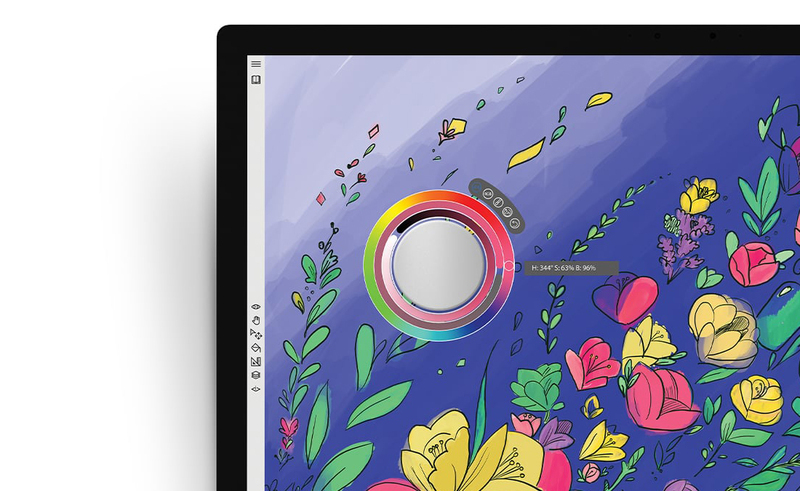 There are third-party apps that support it fully, of course -- Sketchable, Metal Canvas and Drawboard are some of the heavier-hitters -- but without Adobe, Autodesk and other big names on board, it's an expensive gamble at this point. It's these small details where Microsoft has missed the mark. It's been easy for creatives to accept the Pen's shortcomings or the Surface Pro 4's lack of power because they're part of a secondary device chain. It's tough to trust that same basic proposition to be the center of your workflow. Especially for $3,000. The majority of creatives we spoke to weren't planning on moving over to the Studio. A lack of power and upgrade paths (the Studio's internals aren't upgradable like on a tower PC) were deciding factors. Bret Recor, founder and creative director at Box Clever, said he was "definitely interested in seeing how it can help us with our design process," and is "more concerned about Windows 10's stability with demanding software" than latency or input lag. He is also hoping to see if Microsoft offers models with higher-performance processors. Withers said "it looks like an excellent piece of hardware," but he has "always been really reluctant about closed-off systems like these where upgrading and replacing parts is largely off the table. At $3,000? That's a hard pass. It doesn't offer nearly enough improvements over the machines we have, and even if it did, indie comic creators like us just don't have that kind of disposable income to throw around." "If I take the long view," Comfort said, "I can see this sort of thing getting picked up by a lot of people down the line. If you look around the digital artist landscape in five to 10 years, you might have a lot more of these kinds of computers being used by a lot more people. And if somebody were looking to go from a regular tablet to something like a Cintiq, this would be a really nice alternative that's a similar price." Scott-Baron, however, said Microsoft's announcement has "pretty much killed any interest" he had in picking up a [Wacom] Cintiq. "I'm not planning to buy the Surface Studio right away, but it's my first choice for my next desktop PC solution. I would gladly move all my games-development work to the Studio, but I would never give up my Surface Pro 4." Olly Skillman-Wilson, a game artist working on The Signal From Tölva, uses a Wacom Intuos 4 every day for work and general computing, and says "there is certainly some appeal in the thought of being able to do 3D high polygon sculpting on a huge retina display." However, he can't justify the cost for "the specs of a desktop from two years ago," as "it's just not something that is going to be replacing the complex chain of tools that make up my very specific workflow. A 3D version of paint is not going to, and probably not trying to, replace that." "Indie comic creators like us just don't have that kind of disposable income to throw around." Coello was on the fence. He has his Cintiq tablet on an Ergotron mount, which allows for similar display flexibility. "This setup is near-identical: It would slot right into my workflow," he said. "Will definitely be buying the the Dial, but the Surface Studio? I dunno. I like the option of being able to upgrade my components if something goes wrong or it's time to upgrade." Nonetheless, he said it was a very interesting proposition, and that seemed to be a general consensus, at least when it comes to the idea of the Studio. Another sentiment held by many is that it's great to see Microsoft bringing these new ideas to the table. Wacom pulls in hundreds of millions of dollars every year. A 27-inch Wacom Cintiq costs $2,800, and it needs to be plugged into a computer at least as powerful as a Surface Studio. So Microsoft's $3,000 starting price doesn't seem crazy after all. This is Microsoft's first attempt at a desktop, and the first time any company has tried to put this level of functionality into a single, standalone device. Put the Surface Pro 4 and Surface Book next to the original Surface and Surface RT, and it's easy to see what a difference some refinement can make. It'll certainly be interesting to see how improved the Studio is in four years. If it really wants to own this niche market, it'll need to produce Studios with different screen sizes, performance levels and price points. But, from initial reactions, Microsoft is off to a very good start.